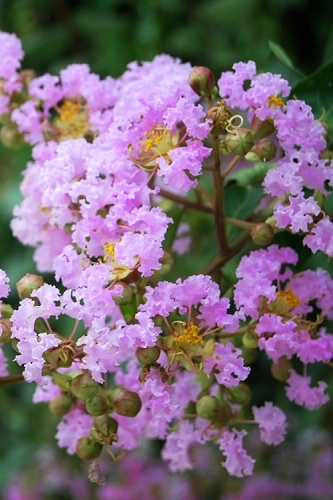 When it comes to pruning crape myrtles, it would be better to leave them alone than to prune them improperly. 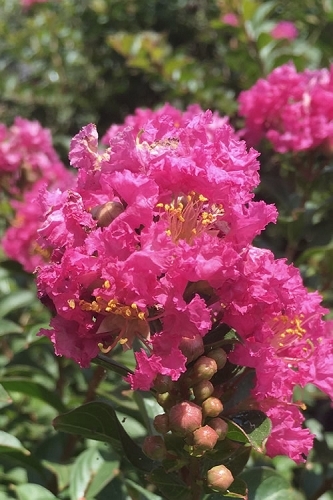 We've all seen over-pruning, when each and every year people chop crape myrtles back too far, and those ugly "knuckles" or giant "fists" begin to form. These fists grow larger every year when gardeners and lawn care "professionals" cut last years knew growth back all the way to the knuckles. 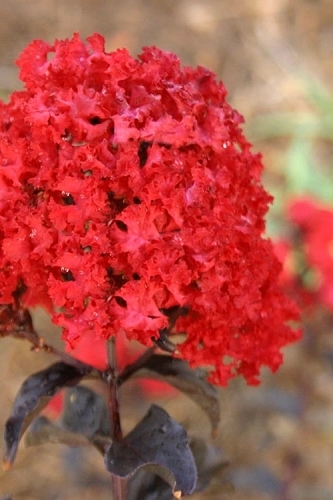 Produce larger but fewer flower clusters than it normally would. Produce much longer new branches than it normally would. 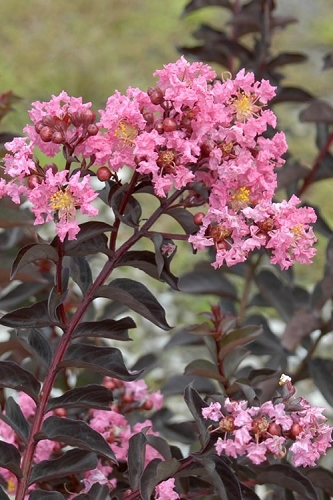 Longer weeping branches and larger flowers clusters might sound nice, right? 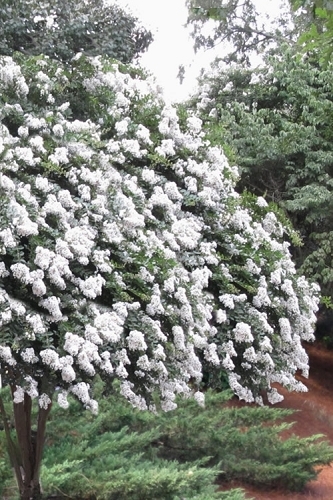 However, when the tree is in full bloom those long branches can't support the weight of heavy flowers. Then a rain comes along and the branches weep to the ground and often break off. Not good. But it doesn't have to be that way. By using the method of pruning I describe below you can avoid these problems. 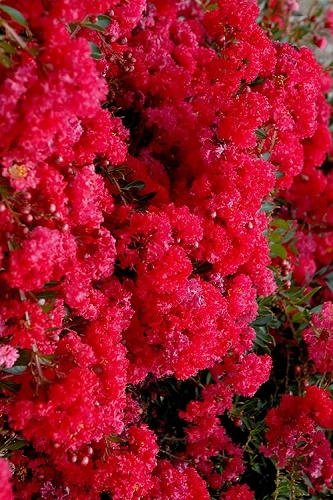 Instead , you'll be pruning in a way that promotes twice as many branches each growing season - which means a fuller canopy and twice as many blooms! 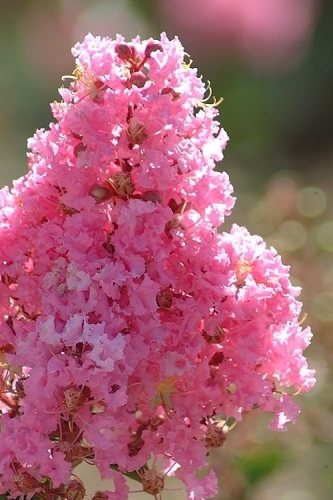 It will produce twice the number of branches, and therefore twice the number of blooms as it did during the previous year. 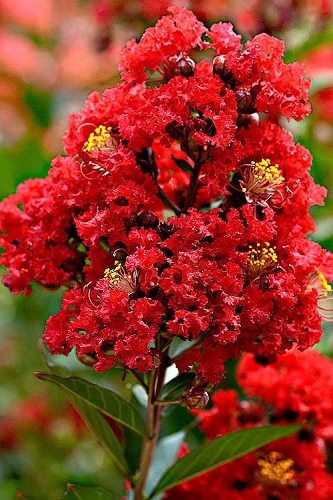 Note: When a crape myrtle has reached 5 to 8 years in age and/or has developed a nice, full canopy, I usually discontinue pruning on the top of the tree. Wrong-season pruning would mean November and December. 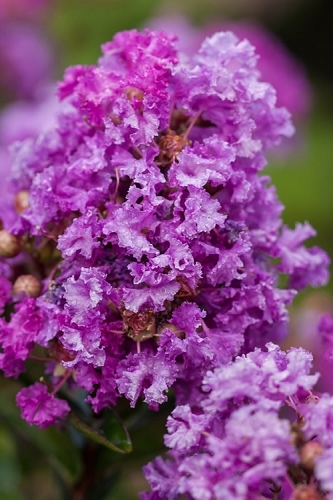 Don't let "peer pressure" by neighbors and commercial gardening crews get to you. If you trim the crapes in the last two months of the year, and we get a warming trend right after, the trees might actually start putting on new growth. That new growth will be highly susceptible to freezing weather. New growth will also tend to draw the cold right into the plant, causing needless damage to a tree that should be resting in dormancy. 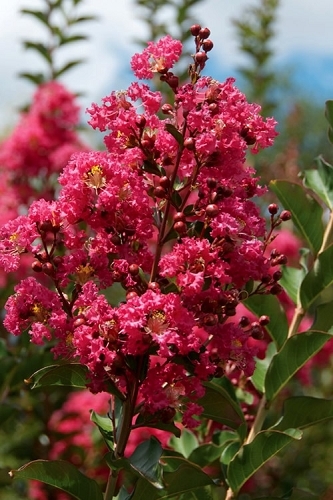 So, the best time to prune crape myrtle is in late winter or early spring - just prior to new growth emerging. For years, I've suggested this as a great time to prune them because at that time we're also pruning our roses and many other plants and trees in the landscape. 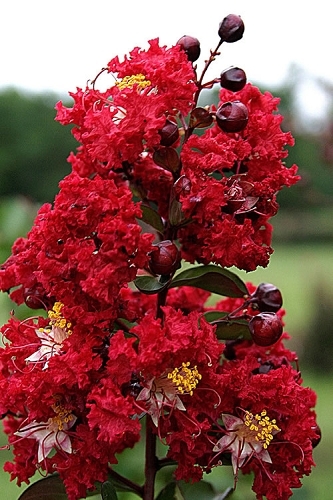 Note: If new leaves have just started to emerge on your crape myrtle tree, it's okay to go ahead and prune. Just don;t wait too long. 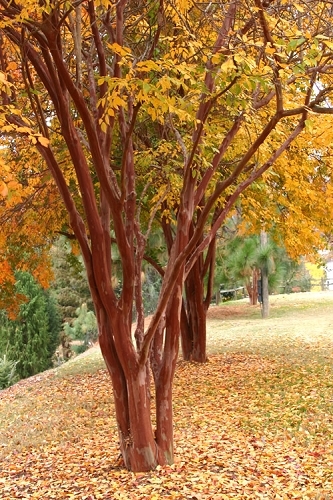 Figure A below depicts a 4-year old crape myrtle tree as it may appear in late winter, when still in dormancy, and before new growth has begun to emerge. This tree has been properly pruned for 3 years and is ready to be pruned for the coming year. 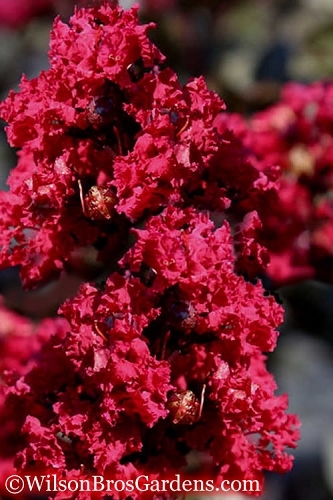 If your tree bloomed the previous year, and you didn't remove the seed clusters, you should see these at the tips of at least some of last years stems. In studying the diagram more closely you will notice where pruning cuts were made in previous years, and that wherever cuts were made two new branches emerged from beneath the cuts. 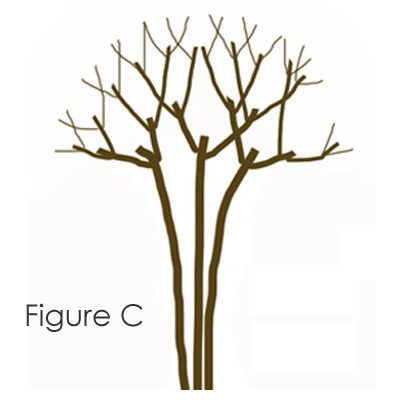 Figure B below indicates where to make cuts when pruning your crape myrtle tree. 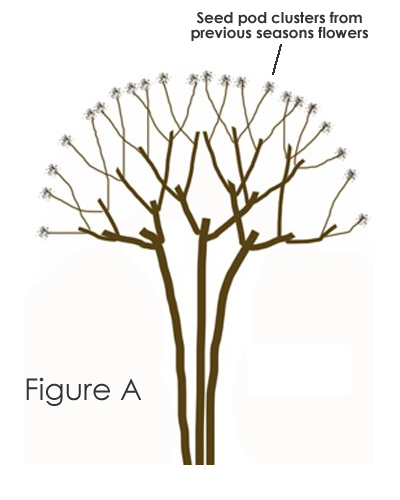 The rule of thumb is to trace down from the top of a stem (from the seedpods if the tree bloomed), to where that stem meets a branch. Using a pair of sharp bypass or lopper pruners make a cut about 6 to 12 inches or so above the intersection - never below the intersection. Alternatively, when deciding where to make your cuts, you can grab the tip of stem and bend it over, making your cut right at the point where the stem starts to bend. Either way, the stub that is left should be strong enough to support the new branches that will emerge just below the point at which you made your cut. Repeat this process until all stems have been cut as is shown in Figure C below. 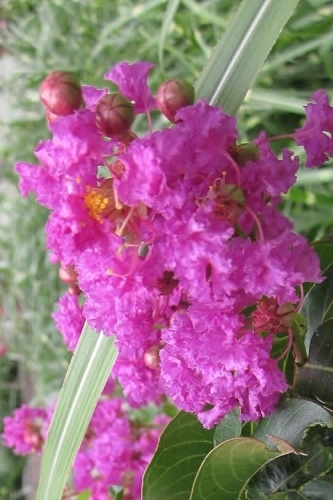 Figure C below shows a crape myrtle that has been properly pruned. 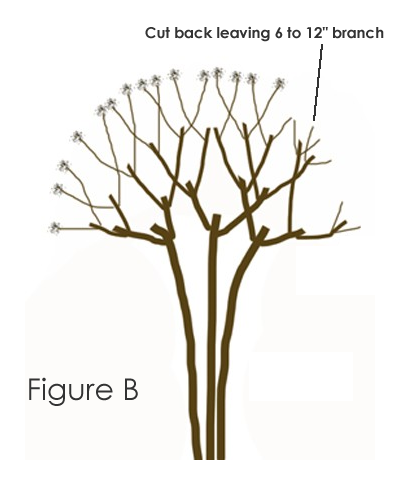 All top stems have been pruned to a point 6 to 12 inches or so above the intersection where the stem meets a branch. Two new stems will emerge from beneath your cuts. 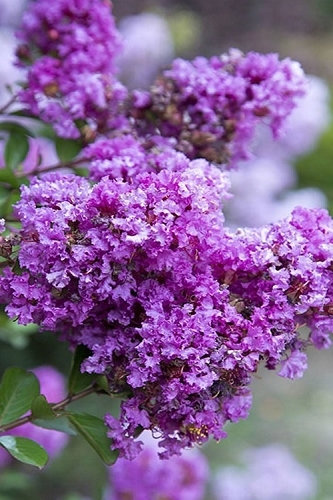 By using this method of pruning you will be promoting twice as many branches every season - which means a fuller canopy and twice as many blooms. 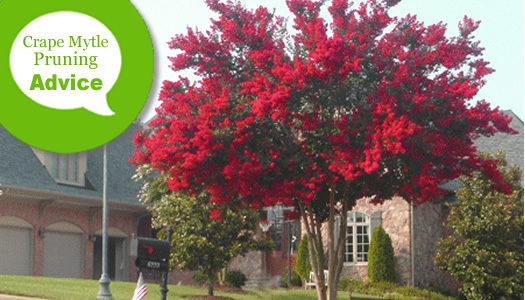 To further "clean up" your crape myrtle tree, you can also prune any suckers that grew from the base of the trunk and any twiggy growth that emerged up and along the main trunk(s). That's all there is to it. 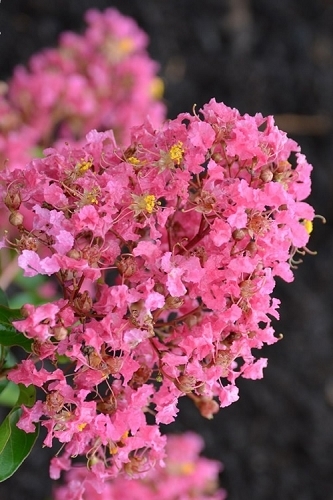 Now you can sit back and watch your crape myrtle grow much fuller and produce twice as many flower clusters every season!